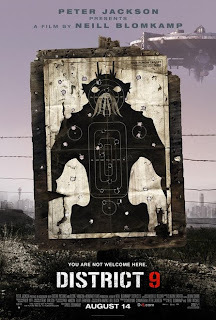 3-D Monster: District 9: My Review. Now for the good; I loved the parrallels made between human and prawn racial discrimination. The special effects were top-notch as was the acting. The fighting scenes, especially the one at the end were absolutely white-knuckle city! I thought the Nigerian gang storyline was a welcome and well done addition. And I really enjoyed the prawn/human relationship that develops. Overall, I realy enjoyed the movie and look forward to seeing it again on DVD. I give it 3 out of 4 stars.